We cover how to improve your social media plan for 2019, from finding the right metrics to identifying your target audience and more. By now, your 2019 social media marketing plan should be in full swing. But if it’s not, or if your performance numbers already underwhelm, it is never too late to revisit your social media strategy planning. A few smart tweaks could provide your segway into a bumper 2019. 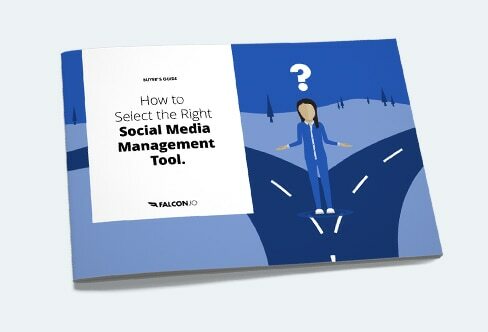 So what makes a successful social media strategic plan? Aside from being clear, concise, and measurable, it also needs to outline your goals for the year and how you’ll achieve them. If you want to learn more about how to measure your social media performance, take a look at these 7 underrated social media metrics you should be tracking. And if you’re interested in content marketing, check out our interview with the founder of the Content Marketing Institute on how to build a successful content strategy. Before you can start considering your social media marketing strategy, it is crucial that you gain an in-depth understanding of your brand’s social performance in the previous year, half-year or quarter. We’ll speak in term of “years” for the purposes of this guide. Look carefully at the metrics from each social channel so you can see where and how you have generated leads, driven traffic to your website, pushed social follows, and increased conversions. Make sure you align these results with the goals you set for the previous year. Although a high number of likes and shares of a particular campaign you ran may look encouraging, ultimately you need to ensure every campaign is achieving its specific pre-defined objectives. Tracking social metrics in relation to your brand’s social goals will allow you to monitor whether your social media performance has been successful in terms of ROI (return on investment). After you have fully audited your year’s social performance, you will have a clear understanding of your 2018 successes and failures. You can then use this information to plan an effective social media marketing strategy for 2019. You can break down your 2019 social media marketing goals into two categories: branding and revenue-linked. Your social media audit should also feed into goal setting, as it will give you a clear picture of what needs to be achieved in the coming year. Are you setting smart goals for your social media marketing plan? Source: Hydrate Marketing. Break each goal down, documenting what you want to achieve, so you have measurable and attainable objectives to work towards. Then identify which key metrics should be used to measure your progress toward your targets. For example, if you have a goal of generating leads, what metrics should you track and what are the measures of success? Number of leads – Specify how many leads are you aiming to collect, and how this number breaks down across the different social media platforms. Content metrics – Track metrics based on content type, designs, images, ad campaigns, etc., to understand what content is performing the best. In-depth data – Dig down to determine the long-term impact your social goals are having on your business. Analyze which social channels, campaigns, content, and other elements are driving leads that then convert into paying and returning customers. This data can then be used to prove ROI. By defining your goals, and what metrics to track to measure their success, your social media marketing strategy immediately becomes a useful and workable document. Demographics – Age, gender, interests, education, employment, etc. Topics discussed, comments written, hashtags used, and posts liked and shared. Once you have a better insight into your audience, and how they are behaving on social media, the next step is to create Audience Personas. Whatever your business, your audience will be made up of different audience ‘groups’. Break down the data to find out who your different audience groups are, where they all hang out on social media, what content they are engaging with, and more. For each audience group, you should then create a persona, helping to clearly define who your followers are. 90% of companies using audience personas say they have led to a clearer understanding of customers. The insights gleaned from your audience personas should be used to tailor your social media marketing strategy and help you to develop clear strategies to ensure you engage with all target audiences on social media. Audience personas should inform content creation, marketing campaigns, ad targeting, and more to ensure conversions against your goals. It is important that you identify your key distribution channels and define your strategies for each channel. Last year, Statista identified the most important social media platforms for marketers worldwide. As you can see in the graph below, 67% of marketers said Facebook was their most effective social channel, with Instagram at 10%, Twitter at 5%, and Pinterest just 2%. However, although these generic stats are useful at providing a bigger picture, knowledge of how your own brand and audience interact on social is much more powerful. Research will show the social media platforms where your audience is most active and engaged with your niche and brand. This will help you determine where to focus the majority of your resources. Your marketing strategies will differ for each social media platform. For example, it may be that you will use Facebook to create an interactive community via your Facebook page and groups, while on Instagram you promote your products through beautiful images. Your social media marketing strategy should document your brand’s purpose on each social media platform. You can then adapt your content and actions on each platform accordingly. Use your audit from 2018, as well as your audience data and audience personas, to help you determine each channel’s purpose and what content performs best on it. Twitter – Twitter is more a news platform. Curation and retweeting is thus encouraged here. You definitely want to focus trending hashtags and topics. LinkedIn – The Professional network where industry articles, interesting data and short, to-the-point sentences go a long way. Instagram – A platform well suited for visual brands. Pictures, call-out quotes and short videos are doing well here. Pinterest – Also great for visual brands as it’s completely geared towards imagery. Most users look for inspiration here. Much research has been done on when brands should be posting. By understanding when your audience is most active on social, you can post content at the optimal time for your brand, ensuring the highest levels of engagement. Facebook – Best days to post are Wednesday, Thursday and Friday, with the key time being 12 – 4 pm. Instagram – Best days include Monday, Wednesday, Thursday and Friday, while the key time is 11 am – 1 pm. Twitter – Best days to post are Monday, Tuesday, Wednesday and Thursday around 12 pm. LinkedIn – Look to post between 5 and 6 pm on a Tuesday, Wednesday or Thursday. For more information on optimal days and times to post, along with the stats to back up this research, check out our article: What are the Best Times to Post on Social Media in 2018? Of course, along with this data, you need to study your own audience and when they are most active on social. Combining these findings will enable you to identify exactly when your brand should be posting on each channel to ensure you connect with your target audience. This info can then be used as part of your social media marketing strategy to create an accurate and successful posting schedule. Which social channels are they using to connect with their audience? What are they doing well and not so well? What content are they producing and how is it performing? Where do they need to improve on social? The most effective way to do that is with social media listening. Monitoring the sentiment around competitors’ brands and within your niche is also important. This will help you to understand which key industry terms are trending, what content and campaigns audiences are responding too, and how competitors’ strategies are changing over time. Use social listening to track competitors as well as trends and opportunities. By understanding your competitors and how they are interacting with their audiences, you will gain a better understanding of your market. You can then use these insights to better inform your social media marketing strategy. Also see: Uncover Social Secrets: How to Use Social Media Listening. As you can see, there is much to consider for your 2019 social media marketing strategy. Use the data from your 2018 social media audit and dig deep to find key information on your social media performance, your audience’s behavior, and your competition’s actions. This will ensure that you are well placed to create a precise, workable, and goal-driven social marketing strategy moving forward. Need help making sense of your data? Falcon.io’s numerous analytics and listening tools can help. To find out more, Request a Demo today.